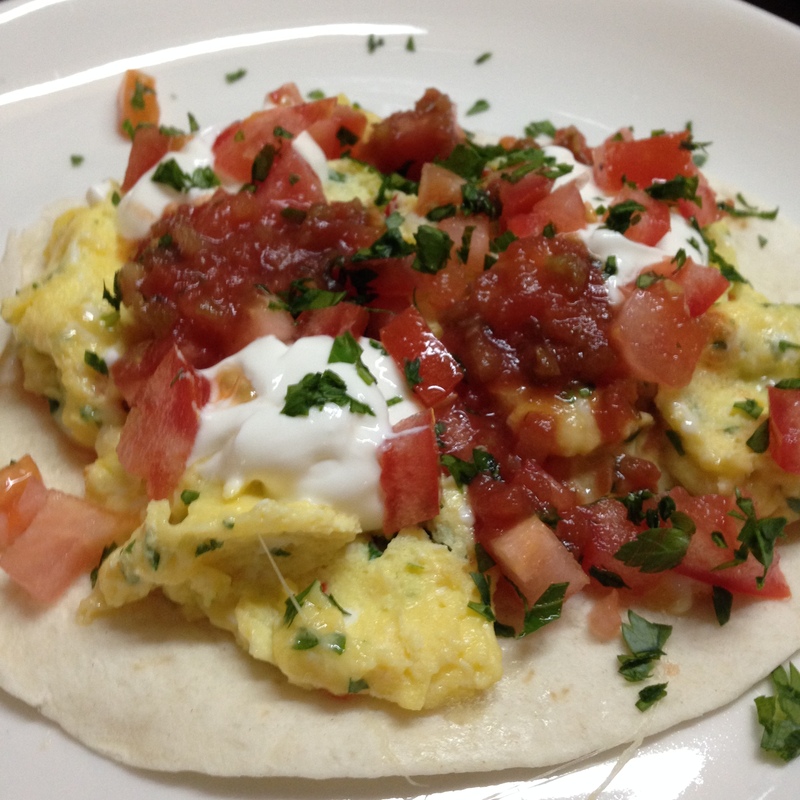 Eggs With A Mexican Twist. Busy lives demand fast, healthy meals that hit all the high notes in taste. This dish offers protein without meat, speed in preparation and savory flavors sure to please. It’s versatile too. We love eggs for dinner and this is a favorite at our house, we hope it will be at your table as well. You can do the “Hungry Man or Woman” version and use 3 eggs. chopped fresh herbs (we used Italian parsley) try sliced green onion too! We begin by cracking the eggs into a bowl and adding chopped red chili. Set aside. Next chop fresh tomatoes and avocado and herbs. This takes just minutes. Grate some cheese. This is a good way to use up those bits in the fridge Just a little to keep fat in check. Place two non stick pans on the stove. You will heat the tortillas by placing on the hot pan for 30 seconds per side. Make the scrambled eggs while you heat the tortillas. Season with salt and pepper. Assemble the best dish by placing the scrambled eggs on the warm tortilla, then topping with dollops of sour cream, the chopped tomatoes, avocado, cheese, salsa and herbs. It took Elfie no more than 15 minutes to make this start to finish. It’s rich in protein from the eggs and avocado and bit of cheese. It’s going to be your new favorite meat-free supper!